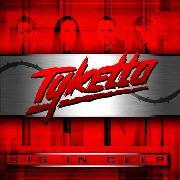 New Yorks TYKETTO came down like a bolt out of the blue in 1991 when they released ”Don´t Come Easy” on Geffen. The single “Forever Young” was well received and their future seemed shiny and happy. But along came grunge and past laurels on Headbanger´s Ball vanished. In 1995 came the belated “Shine”. Danny Vaugn had left to treat his wife, and original members Brook St James, guitars, Jimi Kennedy, bass, and Michael Clayton, drums were joined by Steve Augeri of TALL STORIES. The sound was gentler to say the least. Augeri soon left for JOURNEY and the band soon expired with the live album “Take Out & Serve Up Live”. The members went on with their projects, and VAUGHN no surprise contained Danny, Michael and bass replacement Jamie Scott. In 2004 came a reunion in full, followed by another string of dates in 2007. An alternative and unearthed album was released, a supposed farewell. They couldn´t keep out for long and 2008 and 2009 saw they playing more gigs and festivals. And now this new album, the first new studio album since almost Adam and Eve. How does it sound? Opener “Faithless” shows maturity and works well without leaving a “Forever… -feeling” behind. An acoustic opens “Love to Love”, only to be sidestepped by an 80´s riff model 1A and a straightforward refrain. The years have gone by and the reckless lyrics are replaced by the likes of the bitter “Here´s Hoping It Hurts” and the experience-based “Battle Lines”. But still there´s a solid “whooh” in the opening lines of “Evaporate” and the grittier riffs of “The Fight Left in Me” and, to a slighter extent, “Sound Off” says “Hey, we´re not that old!”. They also master JOHN WAITE`s soft storytelling in “Monday”. Unfortunatelyt both Evaporate” and “Monday” have tendencies of running on empty and there are dead moments when they aren´t rocking enough. But for a band with their patchy history it´s not bad at all!